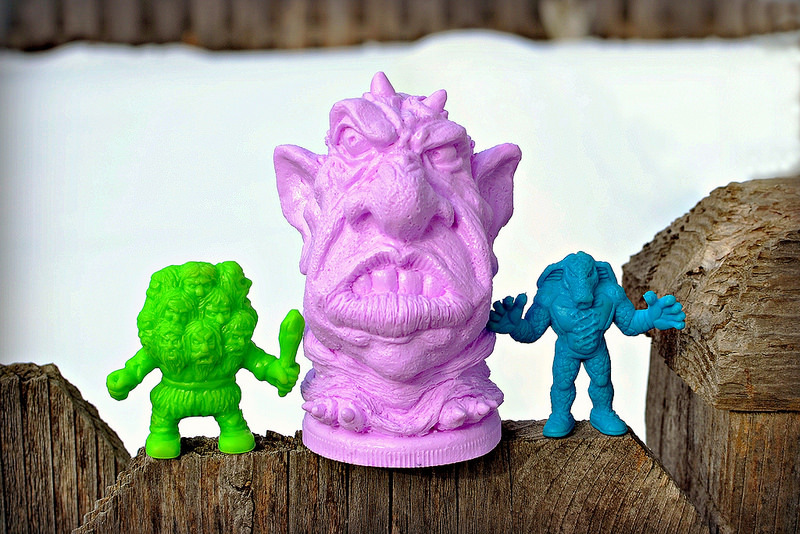 Little Weirdos: Mini figures and other monster toys: Troll resin figure by John Tatarelli Jr.
Troll resin figure by John Tatarelli Jr. I recently became acquainted with artist John Tatarelli Jr. on Facebook, and I am glad I did. 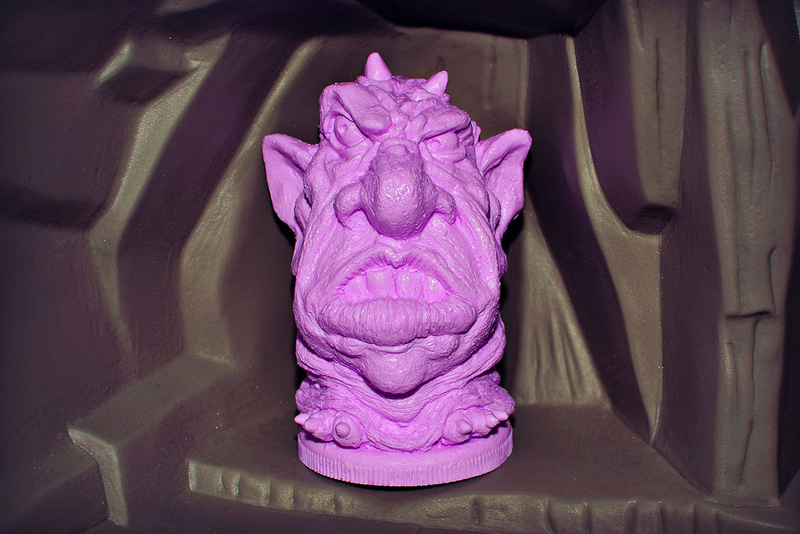 John is a sculptor who created the handsome fellow you see staring at you above, his Troll figure, as well as other excellent horror and fantasy-themed pieces. He kindly offered to send me a Troll, and I have to say, it was love at first sight! There's so many things that are awesome about this piece. The sculpt is just so fun, creepy and expressive. The exaggerated features and proportions remind me of classic weirdo toys like Nutty Mads. From its giant ears and nose to its pointed hair tufts on the back of its head to its toes sticking out at the bottom, the figure just oozes personality. It really has a great vintage feel to me, which I love. 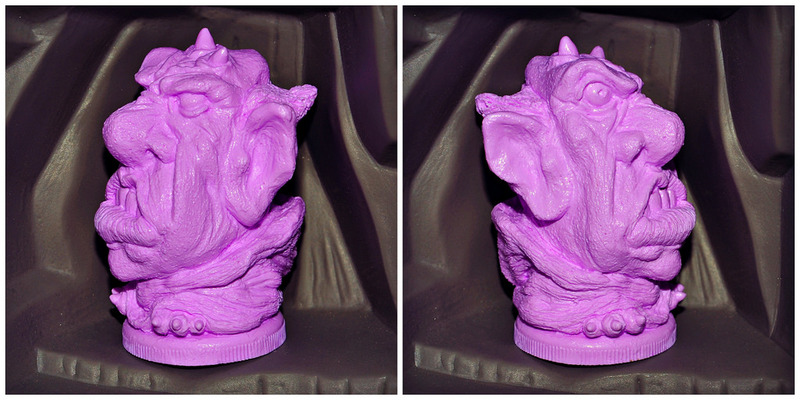 The figure is cast in solid resin and is about 3" tall, which makes it a really nice display piece. Not too big, but not too small to show off its details on a shelf. The Troll sits on top of a circular base, which really gives the figure the feel of a mini statue. I'm also a big fan of the colors John chose to use for these. You've got to love a bizarre, grotesque monster cast in pastels. It sort of makes them look like big, fruit-flavored troll marshmallows. I got a pinkish-purple one, but there's a bunch of other colors available, including green, blue, orange, yellow and more. At the time of writing this, there are plenty of Trolls available in John's online store, with each standard color piece going for $12 and special colored pieces (such as glow-in-the-dark and striped) going for $15. John also has some of his other work available in the store, done in a similar style, including CHUD and a "Blind Dead" hooded skull! You can see more and keep up with John's work on Instagram and Facebook. Saw this over on Instagram and i think its so cool. It is, and it looks even better in person. Really nicely-priced, too.